Several tuning companies have made performance chips for our cars. Dinan, Racing Dynamics, Jim Conforti, Turner, among others. 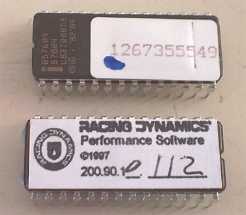 The chip shown here is a Racing Dynamics chip I bought on Ebay. Chips are approximately $75-$375 depending on make and source. Chips are specific to the year/model/version of the car. 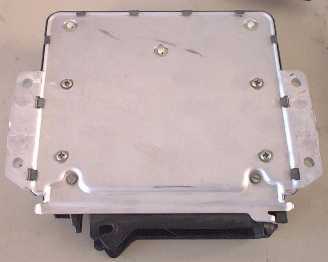 More specifically the DME (Digital Motor Electronics) also known as the ECU (Electronic Control Module). For later engines like mine there is no mechanical method to change timing, so the chip re-maps the timing and fuel injection system to take advantage of higher performance than stock. The use of super unleaded fuel is usually required too. Claims of 19 or so horse power gains are pretty common. It also raises or removes the rev limiting safety features. Below is all the steps needed to change the chip. This example is from my 1989 BMW 635 but the same or similar techniques can be used on your model. 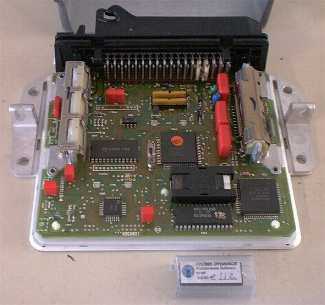 Many 1996 and newer BMW's have chips which can be reprogramed rather than replaced. This are sometimes called 'Shark Injection'. Changing or reprogramming chips is usually one of the quickest and cheapest methods to improve performance. 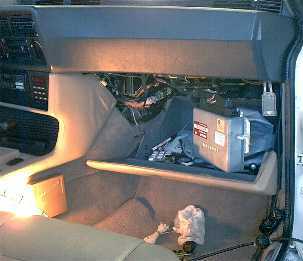 Often, when smog tests are required the stock chip will need to be re-installed first. Caution: Use static safety precautions, and maintain a clean working environment. Here is the old and new chips. In my case its a 28pin PROM. 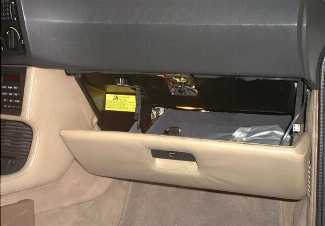 Open the glove box and remove the upper cover plastic piece to gain access the upper underside of the dash. 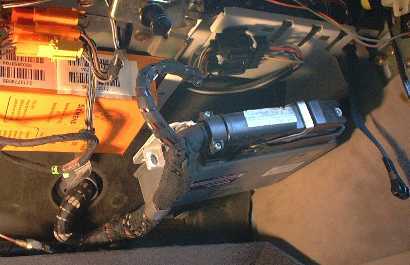 The ECU is mounted on the ceiling in the dash. Unscrew the four retaining screws to lower the ECU box. After removing the attaching screws, bring the unit down to gain easier access to the multi-pin plug/socket. The plug has a lever to release the plug from the unit. Release it and bring the unit to your workbench for chip fitting. 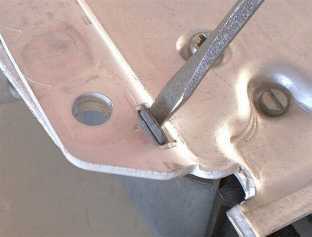 Turn the unit over and bend open the cover retaining clips. There are at least 6 of them around the unit. Turn back over and remove the cover. The chip should have a retaining cover which just simply clips on. Lever it off. 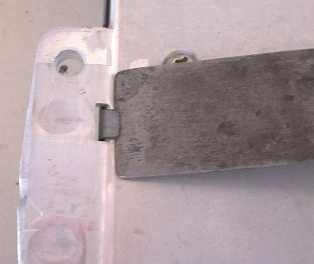 Its purpose is to prevent vibration and 'thermal creepage' from slowly loosening the chip in its socket. 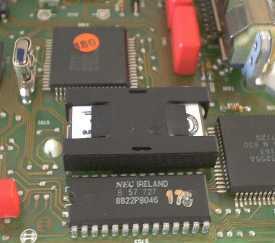 Note the location of pin-1 as identified by the notch on the end of the chip and socket. Using a thin small screw driver, slowly lever off the chip from the ends. 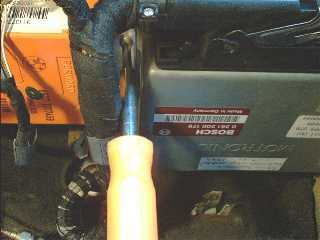 Do a little on one end and move to the other several times till its free to prevent bending pins. Keep the old chip in a safe place in the packaging from the new chip. You'll probably need it to pass smog tests in the future. The new chip MUST be mounted in the same direction as the old regardless if the label is upside down as in my case. 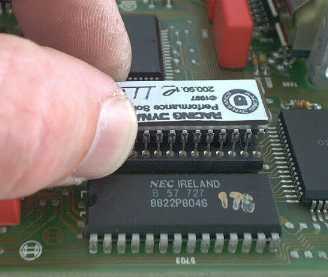 Carefully install the new chip while making sure that all the pins enter their corresponding pin-socket. It may be neccesary to bend the pins by resting the chip on the bench with the chip on its side then bending the pins evenly at once. Repeat on the other side of pins. 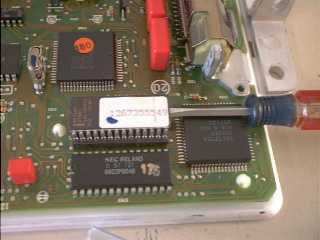 Reinstall the chip cover/retainer and close the cover and reinstall the ECU. Enjoy! I took some 0-60 measurements before and after installing the chip. After 10 runs each I averaged about 1 second faster. Best time was 7.4 sec. I used a G-tech accelerometer to take the readings. 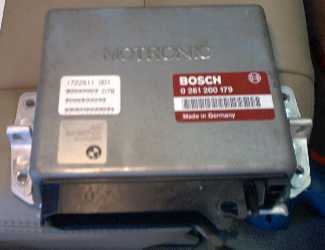 Does my euro 1984 635csi have the same ECU box & arrangement? Its just i've not read that this method of tuning was a common route for owners in the UK! With less emission regulation in the UK I'd guess the performance bhp increase figure could thus be higher? Do you have any figures? another brilliantly photo illustrated article! US spec cars were typically well down on oomph vs Euro-spec ones as standard. Euro-spec cars up to '87 I think were meant for 98octane fuel, wheras standard US pump gas is only about 91 (is this right?). Current UK standard unleaded petrol is 97octane I think, which compares more closely with US spec 'super'. I'm not sure that the conversion above would give a significant improvement over standard-euro spec performance; I am likewise interested to know its compatibility as I don't know if the ECU is different or not, or whether other possible differences (e.g. compression ratio) might limit its compatibility with Euro spec cars. I have just checked some old performance data of Euro vs US spec 635s. you can see that the US 635 is well down on power, plus it is dead lardy to boot. smooth but (at 184bhp) underpowered, which meant it may have sold fewer than any other 6-series variant. In fact the Euro 635 comes closer to the US M6 than any other US model. Superchips in the U,K, for a chip for a 635. Took the 0-60 time from 8.5 secs to 8.0 secs. on my 86 auto 635. Nothing else really noticeable performance wise. Thanks Tony, how much did the chip cost? Have you put your car onto the gallery/side profile pics post? Are you up for a UK Sharkfest meet? UKDaveJ wrote: Thanks Tony, how much did the chip cost? Superchips generally charge about ?295 for chipping older BMWs... Overriding question, obviously, is - given Tony's anecdotal evidence - "is it really worth it?" yes pound for pound improvement seems somewhat lacking to me!! What about Nitrous???!!! UKDaveJ wrote: yes pound for pound improvement seems somewhat lacking to me!! What about Nitrous???!!! From what i remember about 4years ago ?240, with no noticed gain. It did take 1/2 a sec off 0-60 time down to 8secs. powerflow stainless exhaust took 0-60 down to 7.5 secs. Nos is a very easy bolt on, much better performance when you get up to a large dose. Now Nos jetted to 150bhp with fuel jet at 75bhp, now the old girl is really starting to move. 0-60 is 5.5secs. All times are from o.b.c so may not be totally accurate. I have used the giggle gas occasionally for two years now. TCNos635 wrote: From what i remember about 4years ago ?240, with no noticed gain. It did take 1/2 a sec off 0-60 time down to 8secs. powerflow stainless exhaust took 0-60 down to 7.5 secs. Seriously, have you any pics you can post? Got any rolling road print-outs? What mods did you have to do for Nos running? Sorry for the delay with the reply Dave, i dont get on here much. No mods required for nos. Its a very simple install. i could not post pics as i am a complete numpty with a P.C. Starting an upgrade of the system soon. then maybe get it on a rolling road. Anyone Know of an inertia type r.r. near the south coast ? Looking for some descent door mirrors here if you know of any. Also must break the bank for some front wings one day if anyone hears of a good deal. did my best here, one finger typist Tony.